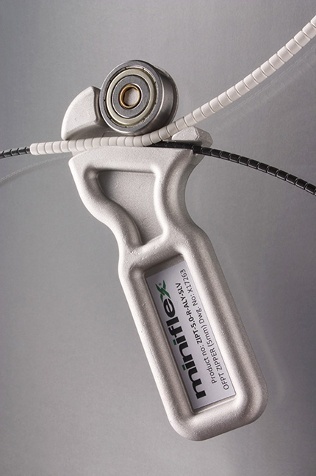 The PPC Zipper Tool allows a slit version of the Miniflex® protective tubing to be ‘zipped’ onto pre-terminated cable and patch cords, as well as long lengths of fiber which cannot ordinarily be pushed into a protection tube. The zipper tool is ideal for retro-fitting over sections of cable that need bend radius control or physical crush protection. The zipper tool allows standard <Ø3mm optical fiber cable to be armor protected without the need to re-terminate and re-test the connectors. This is ideally suited for end user applications where termination has already been completed, or to existing cable infrastructure.